Back home I am all about sustainability. I am passionate about and committed to all things green. It’s even my favorite color. I never feel like I am doing EVERYTHING that I can to live a life of minimal impact and ‘best practices’ as they say in Public Health. We recycle our bottles and papers, we buy many things secondhand, we use chemical free cleaners and bath products, we buy our food in bulk and store it in glass containers or reused bags, we garden organically, mow our lawn with a push mower and own only one car. And we choose to bike as much as possible. And of course, we buy our (whole) food often from local sources, many of whom I know personally. I have spent the bulk of my adult life, especially since settling into a house and having children, trying to be a good steward of the earth. Now, here I am in South America, where, like many other places across the world, I think we romanticize as being quaint, and old-fashioned, which may include such things as living simply and off the land and eating regional foods…..NOT! I am dismayed and confused at the extraordinarily wasteful aspect of this culture. It is not new to me. I have done some traveling in Mexico and the Middle East and seen similar behavior, but I simply can’t wrap my head around it. The wastefulness exists on so many levels it is difficult to begin to describe it. I will start however, with plastic bags. They have become the bane of my existence. It is as if they are a sign of wealth. When I go to the store, no matter which store it is, they send me home with about one bag per item, and these are small bags. I have learned to suggest that they fill them more full; I’ve even had the gall to take things out and repack my own bags. On a typical trip to the ‘target’ style store, I might come home with 8 bags-each containing an average of two items. We have been here for less than two weeks, and our broom closet is bursting with bags. I guess this could be seen as a good thing, since we also throw EVERYTHING in the garbage. I have yet to learn about any alternative disposal for vegetable/food waste. We asked around a bit, and no-one seems to have an idea of what we are talking about. As for the recycling, fortunately there is an informal system of cardboard collectors-they just take it upon themselves to collect what is left on the street, and bring it to the recycling center. According to one fellow, it is a good living. This is, of course, if people don’t just throw their cardboard into the garbage along with everything else. The saddest part of this to me, is where the plastic seems to end up. Jon and I took a bike ride out of the city yesterday, up the mountain road leading out of Mendoza. It was our first exposure to the shanty towns. The makeshift communities where many of Mendoza’s poor families and laborers live. While there was no shortage of satellite dishes attached to the flimsy roofs, the extraordinary landscape of plastic bags and bottles strewn across every hillside was disheartening and just plain awful to look at. It was a reflection of course, of many larger socioeconomic and cultural problems, but painful nonetheless. 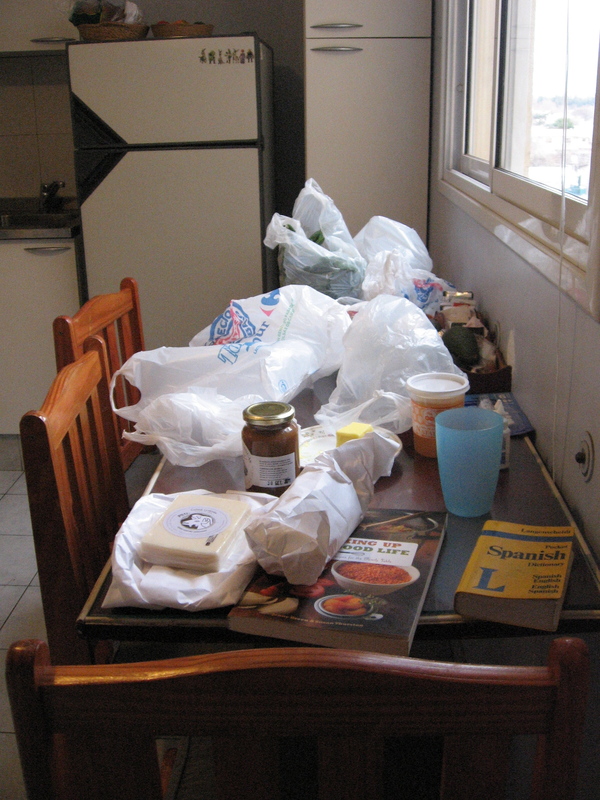 A Stop the Plastic Bags campaign is the perfect place to start your Argentinian career. 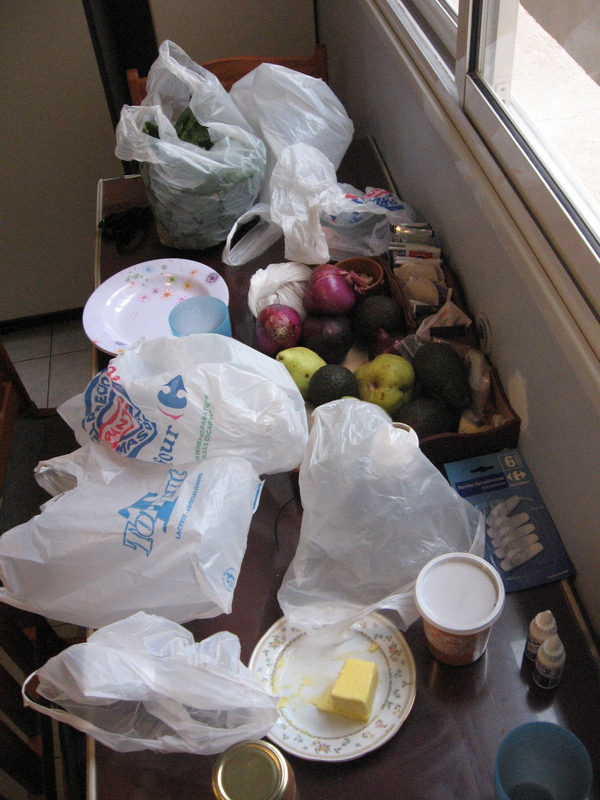 Is reusing of plastic bags a hard thing to do? This will definitely be of use when everybody agrees to stop plastic production. Every year, the demand goes higher, and after that, the waste just doubles. Any other suggestions? Are you feeling crafty? You could cut the bags into strips, and make yarn of it and crochet or knit them into other things. I have done this, and I know a bunch of other people who recycle plastic bags in this way. But, yes, I’ll bet that is frustrating! Wow, now there’s an idea…I’ll see if I can pull something like that off! I’m happy to say that I have seen a few people with reusable shopping bags in the grocery store! funny, my mom and i were just discussing this today. google “plarn” (yep, plastic yarn) and you will see a TON of info, projects, tutorials…even of the YouTube variety. make yourself a cute market bag!? glad things are going well! we miss you at the kitchen! Hey Tracy, great to hear from you! I will have to check that ‘plarn’ out. Could be a cool thing, though I am not much of a knitter…maybe a really long scarf? In any case, thanks for the suggestion. Cheers to all of you there, I miss things and am keeping up via facebook etc. Sounds like it is a lively and fun time there. I hope to join in when I return!